92a had the most liked content! https://www.island-4x4.co.uk/water-pump-90110-genuine-stc639g-p-5168.html or a genuine Land Rover one for £150 + VAT ? https://www.island-4x4.co.uk/water-pump-90110-proflow-stc639g-made-p-27494.html How about one of these in a RED Britpart box ? a lot cheaper than Autopost too? Not much there this year though! Thanks for that Bob, seems so simple when someone explains it like that, will try another injection pump in case that is causing the problem, we had the head off and put a new gasket on when we were looking for the lash caps and I had a good look at the timing (before posting up here) and it looks alright, cant believe that two engines have almost the same problem, hence the new lift pump as it was the only thing we swapped over from the original engine any other ideas would be great? We found 3 broken rockers and almost all push rods bent, but these have been changed, if it was going fast enough to smash all those bits then hoped every thing else was good before it let go , ie pump injectors etc I have attached a couple of pictures I took earlier, how do I know the crank is not 1 rotation out? Supposed to be, have you had one that was out that ran poorly? we bought an engine that had broken its belt as it must have been running to break the belt, the original ran but would not rev which we thought had the head gasket gone? 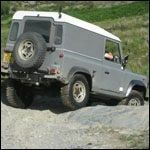 Thanks for that,I do have a good discovery 200tdi and was thinking of puttting the defender bits on that, Are zeus kits that bad? Capel This sunday ? - who went ? Yes got a brand new series 3 speedo for a tenner, was hoping to get a set of 205 16's but no luck yet!